Pic of the day: One of the pictures from the upcoming (or perhaps not) Sim comic. Yes, I am this lazy. Or perhaps not just lazy. Today was pretty awful, at least from the start. More pain, and feeling weak and queasy and even not seeing clearly for some reason. If I had found a fever, I would have truly believed I had an appendix ready to burst. I could not even make myself go out to shop. If it had been a workday, I would probably have called in sick. Luckily the pain receded toward the evening, opposite of normal. I'm still feeling weak, but my appetite is back. Well, sort of. I'm mostly thirsty. Thanks so much to the local waterworks, I dare not drink the tap water here without boiling it, so it's hot clear soup again. True, the water will only make you sick now and then. But I really don't want to risk that right now. And I've used up all the bottled water. Oh well. I'm still better off than most humans in this regard, I'm afraid. Good drinking water seems to become a scarce resource more and more. I've been reading off and on during the day, and playing some more Master of Magic. It is still fun, and I can still play it with my left hand while resting my right. 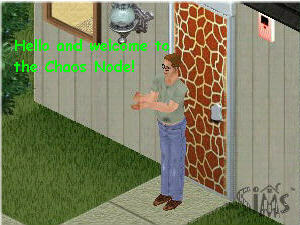 Then I played The Sims a bit to harvest pictures for my latest Sim comic. So far I do fairly little editing of the pictures after taking the screen shots. This may change. Then again, everything may change, and it may change overnight.